KUALA LUMPUR: CIMB Equities Research is positive on the likely pick-up in the progress of the Kuala Lumpur-Singapore high speed railway (HSR) project in 2H17 but concludes that it would be too early to name potential winners. 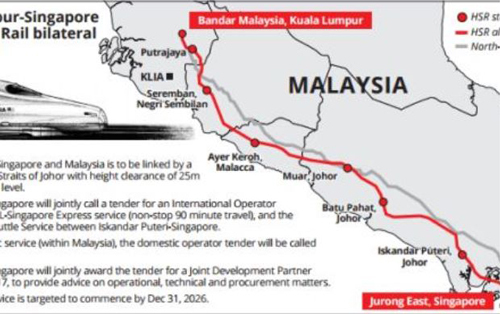 It said on Thursday it believes IJM Corp, WCT, Sunway, MRCB and YTL Corp would be keen to participate in the HSR project. “Within our coverage, Gamuda remains our top pick for the rail theme while Muhibbah Engineering remains our preferred small/mid cap stock. We maintain an Overweight on the sector, with job delays and funding hurdles as key risks,” it said. CIMB Research pointed out MyHSR confirmed that the tenders for the KL-Singapore HSR’s AssetsCo will be called in 4Q17. This brings the HSR project to the next level, as the tenders will appoint a privately-financed assets company for the development of the HSR project. According to MyHSR, the AssetsCo tender is likely to attract 10 consortiums from the 98 companies during the request for information (RFI) stage in 2015. It will be a joint tender by MyHSR and Singapore’s Land Transport Authority (LTA). To kick off the pre-tender phase of the AssetsCo, MyHSR and LTA will jointly conduct an Industry Briefing on July 5 in Singapore. We understand that the appointed AssetsCo will be responsible for supplying, making available and maintaining the HSR trains and its associated systems (e.g. track, power, signalling and telecommunications) and functioning as network operator. Preliminary details reveal that the concession agreement for the AssetsCo will be for 25 years. The briefing will not cover the civil works portion. According to MyHSR, the governments of Japan, South Korea and China are strongly lobbying for a major role in the HSR project. "We foresee each of these governments forming consortiums ahead of the tender launch. We gather that having a local partner in a consortium is not required, though this will be decided upon by MyHSR and LTA later. " “For now, it appears that a local partner in the AssetsCo may have little role to play as most local companies/contractors have limited experience in HSR asset and operations. “We understand that the AssetsCo tender will be among the largest in the world and central to the overall operating structure. The AssetsCo will not be responsible for the civil works. It will lease the trains to the Operating Company (OpCo) International and OpCo Domestic. “The AssetsCo will generate two revenue sources, i.e. 1) concession/availability payments from MyHSR and LTA throughout the concession life, and 2) leasing income from HSR’s operating companies (OpCo’s),” it said.